The gold for sale from the Chinese Mint is anchored by the Gold Chinese Panda. These coins were the third-ever gold bullion coins struck and issued following the Gold Krugerrand and Gold Maple Leaf. First offered in 1982, the coins include a total of five weights to choose from when shopping. 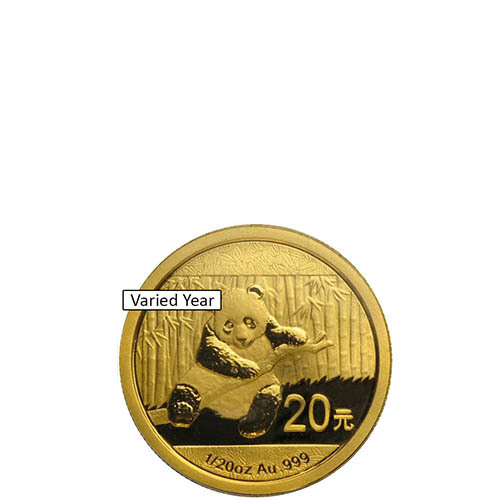 The 1/20 oz Gold Chinese Panda Coins are available to you for purchase online right now at Silver.com. Ships to you with protective flip! First issued in 1983 and available until 2015! Consists of 1/20 Troy ounce of .999 fine gold. Issued a face value of ¥5 or 20 (Yuan) by the People’s Republic of China. On the obverse is the Hall of Prayer for Abundant Harvests. On the reverse is a new image of the Giant Panda with each year’s release. When the Chinese Mint introduced the Gold Panda coins, series included a 1 oz coin and three fractional-weights. After just one year of availability, the Chinese Mint expanded the collection include these 1/20 oz Gold Chinese Panda coins. From 1983 when they were introduced until 2015, the Chinese Mint issued these coins in Troy ounce measurements. From 2016 onward though, the 1/20 oz coin has been issued as a 1 Gram coin instead to connect the Chinese Panda Series to the nation’s use of the metric system. Throughout the original release of the 1/20 oz Gold Panda coins, the Chinese Mint changed the face value of the coins once. The face value of 1/20 oz Gold Chinese Panda coins from 1983 to 2000 was 5 Yuan, while those coins issued from 2001 to 2015 have a face value of 20 Yuan. 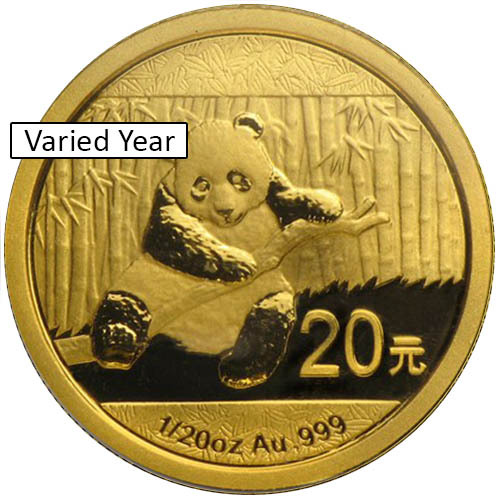 On the reverse of all 1/20 oz Gold Chinese Panda coins is the depiction of a Giant Panda. This species of bear is native to the south-central highlands of China. The creatures are recognizable for their alternating patches of white and black fur. The obverse of the Gold Chinese Panda coin features the Hall of Prayer for Abundant Harvests within the Temple of Heaven complex. The largest building in the complex, the hall was built during the reign of the Yongle Emperor who also oversaw the construction of the Forbidden City in Beijing. All 1/20 oz Gold Chinese Panda coins in this listing come from varied years of issue. Silver.com cannot guarantee the year of issue or design you receive; that will be determined by the availability of coins in our warehouse when your order is processed for shipping. Additionally, these coins have been unsealed from their original Chinese Mint packaging and ship in generic packaging.